According to Wikipedia, St Patrick’s day, celebrated by the Irish on March 17th, is characterised by attendance at churches, wearing green attire and, what seems to be the reason for most of the celebrations, “the lifting of restrictions on eating and drinking”. The biggest celebrations take place in Dublin, but St Patrick’s Day has also been the day for the Irish in Australia. While I’m neither, the notion of “lifting of restrictions on eating and drinking” gets me pretty excited. So much so that I’ve decided to Irish-up my Mum’s version of the humble beer bread with a good splash of Guinness. Love it or hate it, because the views on the distinctive bitter taste of the dark ale from Dublin are as polarised as day is far from night, I’m totally in love with this simple 4 ingredient bread. It’s crusty where it should be. Deliciously moist on the inside with big air bubbles that make a good bread, well, good. There’s no need to knead either, just fold, bake and be merry! Any full bodied draught beer can be used in this recipe, but I find that Guinness gives the bread a wonderful character that goes well with pickles, salamis or simply, a generous slather of good organic butter. I used a half half ratio of plain and wholemeal flour, but you can increase decrease this as you wish. Spelt flour also works well. Prepare 1 day ahead. You will need a round oven-safe dish with a lid (dutch oven or casserole), heatproof to 240C. To make the starter: sift flour into a large bowl. Add salt, yeast and Guinness. Mix for about 30 seconds, until the flour has been incorporated. Scrape starter into the middle of the bowl, cover with cling wrap and st aside in a warm spot for 12-18 hours, or overnight. To make the bread: once the starter is ready, it will be wet but pliable, fold it over itself 3 times. Dust a clean kitchen towel with extra flour and transfer the dough, fold-side down onto the towel. Cover up with the edges of the cloth and set aside in a warm spot to rise for 1.5 hours, it should roughly double in size. Prepare to bake: place your baking dish in the oven, on the second rack from the bottom. Heat oven and dish until temperature reaches 240C (220C fan forced, 475F, gas mark 9). To bake: carefuly remove your baking dish from the oven. Line the bottom of the dish with some non-stick baking paper. Gently lift the bread off the kitchen towel and trasfer into the baking dish. Dust with a little flour, cover with a lid and bake covered for 30 minutes. After 30 minutes, remove the lid and bake for a further 10 minutes uncovered to crisp up the crust. Cover the loaf loosely with aluminum foil and bake for a further 5 minutes. To serve: remove bread from the oven and allow to cool slightly on a cooling rack before slicing. Serve still warm with some good quality butter, cold cuts and pickles. Oh, and a pint of Guinness if you wish. This bread looks amazing! I want a piece! You’ve made me want Guinness and bread… neither of which I should eat at the moment. Perhaps I could make it for H!!! Perhaps perhaps perhaps – you may not be able to resist the leftover beer or the crusty warm bread. You have been warned, but if you succumb, do enjoy it! This looks delicious! What an interesting bread. Well, you see for the bread to turn out really good for St Patrcik’s Day you do have to start it a day ahead… so being a day early is actually a good thing! Happy Birthday for Friday Jennifer! I can’t believe I’ve never had Guinness bread before. It looks so delicious and I bet the flavor is awesome. Bookmarking this! It really is Joanne, deep and rich, like Guinness itself. Really good with salami! A lovely looking bread and perfect for St Patty’s day! I could definitely devour a piece of that bread and butter right now – whether or not there were any restrictions on eating to lift! It sounds great. Ha! I’m sure it is in plentiful supply at your corner store 🙂 Happy St Pat’s Day Magda! Truly awesome bread, it looks incredible. Why do people outside of Britain call it St. Patty’s day though? In Ireland the shortened version of Patrick is Paddy – I find it very strange that somehow it’s different elsewhere… Perhaps you could enlighten me? Oh in Auatralia we’d probably shorten it even further to St Pat’s day, not that we do but that’s just how our English works. I guess Patty has a similar etymology, stemming from localized custom in shortening names. I’d be happy to change it – thanks for picking me up on this! Fantastic photos and I’ll be cooking this for my beer loving husband to try on the weekend 🙂 Delicious ! Happy St. Pattys day to you Martyna. 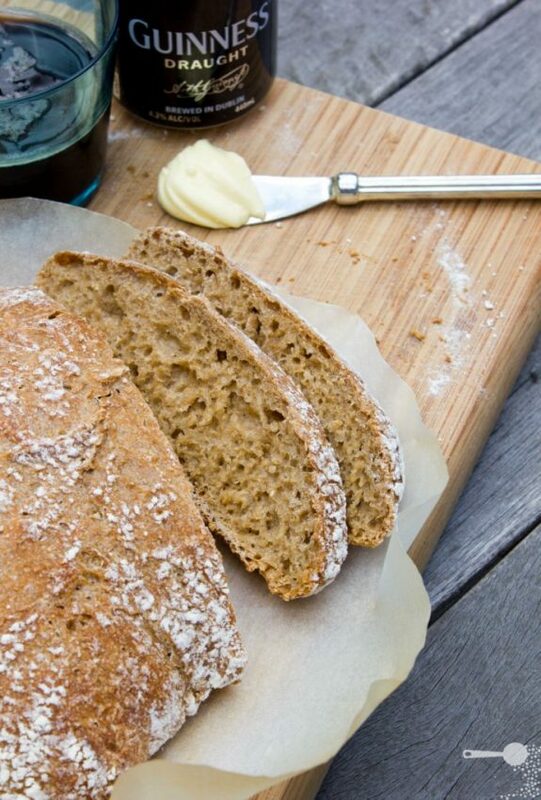 Fantastic way to celebrate this holiday with some of your Guinness bread.